Looking for remedy and resolution in HEALTH, FAMILY, RELATIONSHIPS, CAREER, LIFE WORK etc.? In either case, it is a time that YOUR ARE in the course of EXPANDING YOUR POSSIBILITIES & POTENTIALS TOWARDS NEW YOU or it should be said TRUE YOU! 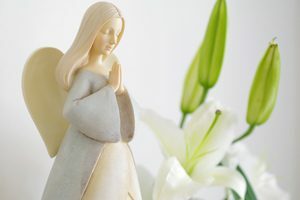 It is a time that you are trying to CHANGE THE PATTERNS OF YOUR THOUGHTs, EMOTIONs and BELIEF SYSTEMs that you had carried all along and finding connection to YOUR SOVERIGN SELF. ＊pukalani＊is a place to support those who are welcoming the timing of their conscious shift and for those like you who want to take care of yourself physically, emotionally, mentally as well as spiritually and energetically. WELCOME TO ＊PUKALANI＊, multi-dimensional healing portal, offering distant healing sessions to any location on the globe. Physically located at Ashiya, Japan. Ashiya is located in between Kobe and Osaka. Easy access from both KIX and Kobe airport. Whether you are living in Japan, or just visiting Japan, ＊pukalani＊ might be one of the options you might want to come and visit to release your daily stress, heal your body and mind, and to find your authentic self. Salon moved from Osaka to Ashiya in May 2018. Some of the lower parts of this page IS still UNDER CONSTRUCTION (trying to put Japanese into English. any help appreciated!!). 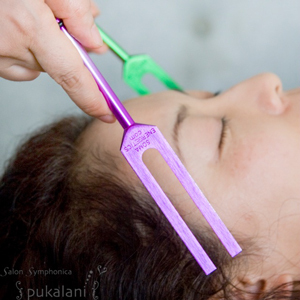 Wakeup Salon ＊pukalani＊ provide healing sessions to support your physical/mental/emotional/spiritual health by enhancing your ability to connect to your authentic self along with spiritual awakening, transformation and integration. In the “sound shower” and healing energies, you will experience a deep meditative state where your right and left brain will be integrated, and you are entering into the multi-dimensional, non linear ever-present co-creating moment. The old belief system, traumatic memories, and unnecessary programs stored in your physical and energetic bodies are to be detected, released and transformed, multi-dimensionally via silent communication with your subconsciousness. Not only will your physical/emotional/mental aspects are to be tuned but your intuitive senses will be heightened so you may live more vigorously and peacefully along with your soul’s purpose. Sounds travel through the air, through everything. Sounds vibrate anything, any form or shape, any objects seen or unseen. Specific sounds with specific intention carry information and move towards specific direction. Sacred sounds with sacred intention work tremendously powerfully on our body, mind, spirit, our existence itself. 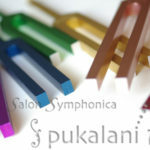 ＊pukalani＊ introduced Solfeggio Tuning Session in 2006 and since then incorporated many other sacred frequencies into the healing session. Some sounds connects physical and spirit realms very efficiently. Each planet has its unique sounds and affects us. There are sounds resonating well with minerals and our cells, DNAs. 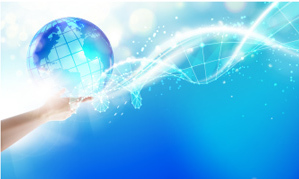 There are special sounds that enhances our transformation and integration. In ＊pukalani＊’s Sound Healing session, the most appropriate sounds in any given situation are to be selected out of more than 100 sacrad frequencies and the potentials of your healing, releasing, awakening, transformation, activation and integration processes are to be greatly enhanced. Quantum Physics, natural laws behind that and the mystic life force energy are the foundation of the work of ＊pukalani＊. From perspective of the Quantum Physics, we live not only in the third dimensional linear space time world but at the same time in non-linear, multi-dimensional space time world. Everything is energetic and relate each other in a unified field. Consciousness has a power and mere observation can change the world. There is no need to physical power to push and pull the change physical form or shaple. Whether it is a hands-on healing session or hands-off healing session, ＊pukalani＊’s session is non-invasive nor controlling towards what appear to be an ideal result. Just simply set a space to its optimum state, and let things shifts naturally and organically. Many of the symptoms or situtations in our reality are often come from our thought patterns, belief systems or past traumatic emotional memories. But behind that there are factors such as ancestral, collective, cultural issues, past and future lives, and even astral or galactic history are associated. Those are multi-dimensional, beyond time space and stored in our unconscious. But they come to the surface and melt by communication with the inner wisdom. With the support of the neuro-kinesthetic bio-feedback system, Keiko, the owner/therapist/healer communicate with your unconsious to see what your bodies are telling you and explore the possible root cause as well as optimum approach for resolution. Keiko doesn’t treet the symptoms of illness, or situation on the surface level, but support the process of releasing, healing, transforming the root cause. 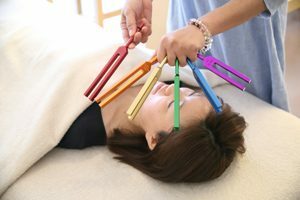 Keiko incorporates many modalities and tools such as Quantum-Touch, Integated Healing, SPT, BT, sounds with tuning forks, crystals and sacred geometry, etc,. into her session without any restriction by the definition of each modality. She integrates all what she has learned with her own knowingness, intuition beyond mind, earned knowledge, or existing modalities. During the consultation before and after the on-the-table session, you have a chance to integrate what you receive. Keiko gives key phrases for you to understand what the session is about. But basically it is very important to recognize that it is not any practitioner who heal you, but you yourself heal yourself with your inner wisdom and nobody else can do it for you. ＊pukalani＊ is here to support you to connect you and your inner wisdom. “Removing the frames that are restricting your consciousness”, “multi-dimentional”, “cosmic detox & activation” are primal keywords here. 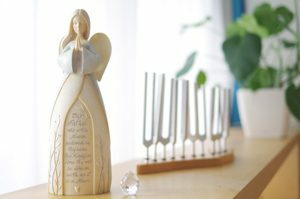 Utilizing the tuning forks that are aligned with “solfeggio frequencies”, which are called as “healing codes” or “sacred codes”. It allows you to connect to the multi-dimensional cosmic world. Healing, cleansing, clearing, transformation and integration in deep-level are supported to enhance your conscious living in new paradigm. “Life on Earth”, “Celebration”, “Pleasure at the cellular level”, “Peace” are the keywords here. 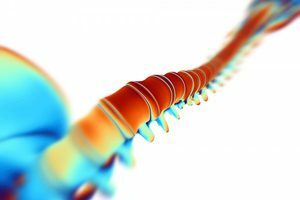 The sounds of the CELLebration Tuners will enhance the rejuvenation of the cells as well as support releasing old emotions, memories and programs restored in the cells. Let’s clear your head and facial area: brain, eyes, nose, neck and shoulders…which are working hard for you every day. Balancing your right and left brains, recovering your eyesight, clearing unnecessary old programs in your thought forms. If you are having repeated thought patterns, suffocating with informations, loosing your eyesight or hearing abilities, suffering Ménière or anemia, feeling fatigues around head area, Head Clearing is one of your choices. Listen to your body and subconsciousness via neuro-kinetic bio-feedback system to integrate all the modalities that your body, mind and soul needs at given moment. From physical symptoms, to emotional, mental wounds to spiritual awakening, this integrated healing session will support your life path. Started in year 2004 at Yokohama, ＊pukalani＊ celebrated its 13th anniversary in April 2017. 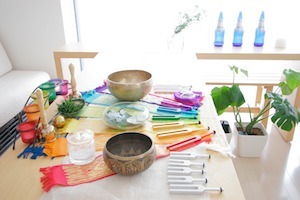 ＊pukalani＊ clinic is now located in Osaka and welcoming various people as clients from healers, therapists to artists, entrepreneur, doctors, company employees to housewives, children to the seniors. For those who cannot come over to the clinic, ＊pukalani＊ offers distant session which you can receive wherever you are on the globe: at your home, or hospital, or while you are traveling. Located in “Kyomachibori” area, “NYC” (Nishi-Ku), Osaka. Just a street away from UTSUBO Park which prouds of its awarded rose garden and water fountains, Kyomachibori area is popular for sophisticated cafes,bars, restaurants, vintage shops and galleries. When you feel like balancing your body and soul, or feel the timing of transformation in your life path, ＊pukalani＊ is here for you. My name is Michaela, I am Australian and I recently met Keiko when she came to Portugal in 2016. 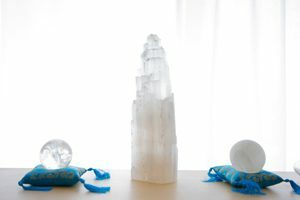 I’m a multi-dimensional Healer myself and have a very strong interest in different types of multi-dimensional energy healing. Plus I’ve been researching, writing and developing an online Healing Program for the last few years. I was very interested to have a session with Keiko and to experience her method of Healing. I saw many parallels with how Keiko and I worked in that we work with clearing negative energies, raising frequency and activating the body and soul’s potential. Except, to explain it simply, I work more with language and she works with tuning forks & sound – yet they are both sound. So it was very interesting for me to have a Soul Physio Session with her. We did the session remotely, with me in Portugal and her in Japan. We also didn’t use Skype as the sound frequency doesn’t carry well over the internet. But there was no need for me to listen to the sound. I lay down in my bed at the agreed time of the Healing. I got more and more relaxed. After 45 mins, I felt myself in the deepest and peaceful place, almost as if my soul was journeying elsewhere. I stayed laying down feeling many energies moving through my body, having a totally still calm mind for over 2 hours. (Afterwards when I ‘tuned in’ and asked, I got that in fact my Soul was actually out of my body receiving healing for at least 1.5 hours.) I could feel energies moving through my body for a number of days afterwards. 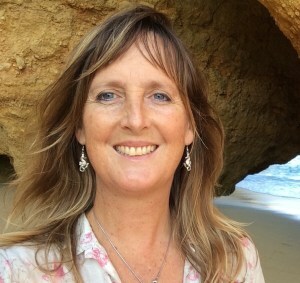 Her session was supporting my Soul with my new stage in my Healing journey and in particular my work. There was clearing of programs from the physical body and the energy bodies. Some of this related to clearing energies relating to my Soul’s journey even outside of this galaxy. She also did some activating of new Soul Codes or you could call it activating of Soul abilities. As we are upgrading our DNA we get access to more ‘information’, so hence the need for activating. I think it is a very powerful method of healing! And Keiko has the ability to really tune into and receive the exact relevant information to your situation. Everyone is unique in their own path and thus you need to work with someone, who has the Light connections and can access and download exactly what it is that you need. Plus Keiko also draws on a very wide body of training and skill set which really helps her to assist others. Thank you Keiko! Using inline frame for this part.